Buckingham Palace movie: The King's Speech with Colin Firth and Helena Bonham Carter. Tom Hooper has won the Directors Guild Award in the Narrative Feature category. Hooper, of course, is the director of The King's Speech, the period British drama that has been doing remarkably well at the North American box office and that was distributed in the United States by Harvey Weinstein's The Weinstein Co.
That's the same company that nabbed a Best Picture Oscar nomination for The Reader in 2008. And that was the year Christopher Nolan's The Dark Knight was a shoo-in Best Picture nominee. The most boring awards-season since, ahem, last year, when Kathryn Bigelow's Iraq War drama The Hurt Locker was winning nearly every award in sight, has now become quite interesting. Will the Academy follow the Directors Guild and the Producers Guild and name The King's Speech the Best Picture of 2010 and Tom Hooper the year's Best Director? Or Academy members go their own way – by following just about every US-based critics group – and pick David Fincher and his Facebook drama The Social Network? The most surprising thing in this race is that even the Hollywood Foreign Press Association, the kind of crowd that would definitely go for something like The King's Speech, opted for the less audience-pleasing – in other words: more sober, less rousing – The Social Network. Expect The King's Speech to win the SAG Award for Best Cast as well. Ironically, if The Social Network – until a couple of weeks ago the indisputable favorite – comes out on top at the SAG Awards, that would be a major upset. Inside Job, directed by Charles Ferguson. Charles Ferguson has won the DGA Award for Best Director of a Documentary, Inside Job, which is also up for an Academy Award in the Best Documentary Feature category. 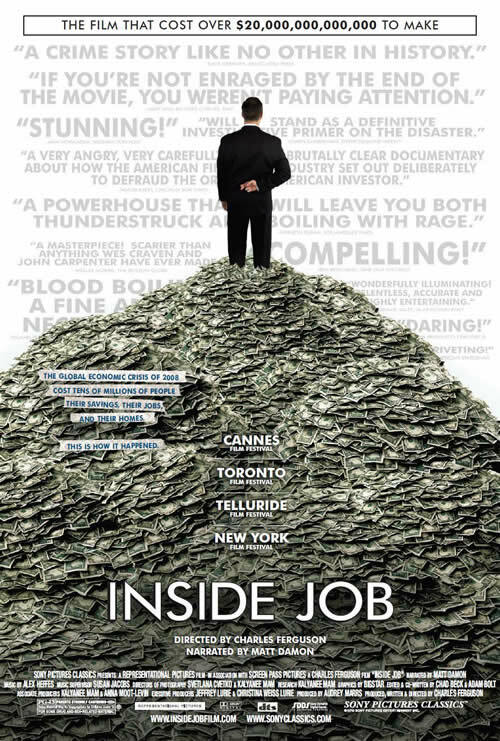 Inside Job tells the ugly story behind the economic meltdown of 2008. Unlike the DGA-Oscar match-ups in the Narrative Feature category – all but eight* DGA winners have won Best Picture Oscars the same year – nearly all DGA documentary winners have failed to take home an Academy Award statuette. In fact, many DGA winners weren't even nominated for an Academy Award, e.g., Asger Leth's Ghosts of Cité Soleil (2007), Arunas Matelis' Before Flying Back to Earth (2006), Werner Herzog's Grizzly Man (2005), and Steve James' Hoop Dreams (1994). Last year, Louie Psihoyos' The Cove managed to win both the DGA Award and the Oscar. “I literally jumped out of my skin when they said our name,” Hooper told TheWrap's Steve Pond. He probably wasn't the only one to get skin reactions following the PGA Award announcement; I'm sure the producers of David Fincher's The Social Network shrank in theirs. Starring Colin Firth, Helena Bonham Carter, and Geoffrey Rush, The King's Speech has a host of enthusiastic admirers. On Twitter, Pond wondered if the preferential ballot system was responsible for The King's Speech victory. He could well be right. Perhaps The Social Network got more 1st-place votes; but if in addition to having a fair share of 1st-place votes, The King's Speech dominated the 2nd- and 3rd-place votes (of PGA members whose favorite film was, say, The Town or The Kids Are All Right) that could explain its unexpected victory. Either way, this makes things a little more interesting at the Academy Awards. Could the Oscars' preferential voting system for the winner in the Best Picture category cause another such upset? Well, if the Weinstein Co. could land The Reader in the Best Picture shortlist (instead of the much more popular The Dark Knight) and the Harvey Weinstein-led Miramax got Shakespeare in Love a Best Picture Oscar, a The King's Speech Academy Award victory – especially following its PGA Award win – suddenly goes from near-totally unlikely to quite possible. Stay tuned. Producers Guild Awards Predictions: Facebook vs. Buckingham Palace? Presenters at the PGA Awards ceremony include Helen Mirren, Amy Adams, Kerry Washington, Andrew Garfield, Mark Wahlberg, Will Ferrell, Amy Poehler, Jim Parsons and Joe Manganiello. I should add that the other nominees for the Darryl F. Zanuck award are Black Swan, The Town, The King's Speech, Inception, True Grit, The Fighter, 127 Hours, The Kids Are All Right, and Toy Story 3, which should earn Darla K. Anderson the award for the producer of the best animated feature. I'm betting on Charles Ferguson and Audrey Marrs to take home the award for producers of the best documentary, Inside Job, which Ferguson directed. Already announced PGA Award 2011 winners include Sean Penn, who'll receive the Stanley Kramer Award; James Cameron, recipient of the Milestone Award; The Social Network co-producer Scott Rudin, recipient of the David O. Selznick Achievement Award; and Tom Hanks and Gary Goetzman, who'll be honored with the Norman Lear Achievement Award in Television. Photo: The Social Network (Merrick Morton / Sony Pictures). Felicity Jones and Anton Yelchin, Like Crazy. Drake Doremus' romantic drama Like Crazy, about a young American and his young British lover who are forced to live apart after she overstays her visa in the US, won the jury award in the US dramatic category. As the Englishwoman, Felicity Jones won the festival's special award for acting. Peter Richardson's How to Die in Oregon, described as a “sober” look at euthanasia – a woman takes an overdose of drugs and dies on camera – was the jury's best US documentary. The best World dramatic entry was Anne Sewitsky's Norwegian comedy Happy, Happy, about a married woman whose sexual appetites are reawakened by a new neighbor. The winner in the World documentary category was Danfung Dennis' Anglo-American Hell and Back Again, about a marine who returns home after being seriously injured in Afghanistan. At indieWIRE, Dana Harris compiled a list of 2011 Oscar nominees in various categories that had their US (or World) premiere at Sundance 2010. Sundance's nine Oscar movies are: Winter's Bone, The Kids Are All Right, Restrepo, Exit Through the Gift Shop, Animal Kingdom, Blue Valentine, GasLand, Waste Land, and Madagascar, carnet de voyage / Madagascar, a Journey Diary. Diarchy, written and directed by Ferdinando Cito Filmomarinoes. The Costume Designers Guild (CDG) was supposed to announced their nominees on Jan. 21 (that's what it says on their site) – but apparently they opted to make their 2011 shortlists public one day early. Nominees for the 2011 CDG awards include the expected, e.g., The King's Speech, Alice in Wonderland, Black Swan, and even Burlesque, and the less expected, e.g., The Fighter, the little-seen The Tempest, and The Social Network. Left out were potential contenders ranging from Shutter Island and White Material (period) to The Chronicles of Narnia: The Voyage of the Dawn Treader and The Twilight Saga: Eclipse (fantasy). Curiously, only three films were announced in the period and fantasy categories. Last year, The Young Victoria won the Costume Designers Guild award in the period category. The film went on to receive the Best Costume Design Oscar as well. This year's winners will be announced on Feb. 22. You can watch online the announcement of the 2011 Oscar nominations, as the Academy's Big Morning will be live streamed. Will The King's Speech get more nominations than any other movie? Probably. How many? Who knows… Other titles and people that will be (almost) surely called out at 5:30 a.m. Pacific Time are The Social Network, Annette Bening, Natalie Portman, Darren Aronofsky, True Grit, Jeff Bridges, James Franco, Tom Hooper, Colin Firth, Winter's Bone, Melissa Leo, Amy Adams, Christian Bale, and Dogtooth. Dogtooth? Well, don't count it in, yet. But don't count it out, either. After all, the unusual Greek submission for the Best Foreign Language Film Academy Award did manage to get included among the nine semi-finalists in that category. Once again, the 2011 Academy Award nominations will be announced on Tuesday, Jan. 25, at 5:30 a.m. PT in the Academy's Samuel Goldwyn Theater in Beverly Hills. Note: If for some reason the embedded video doesn't work (come 5:30 a.m. PT), click here to watch the Oscar 2011 announcements at livestream.com.